The Western Fishboat Owners’ Association (WFOA) is a non-profit association representing albacore troll-vessel owners and supporting businesses in California, Oregon, Washington, Alaska, and Hawaii. We also maintain a limited membership of vessels in New Zealand and in British Columbia, Canada. 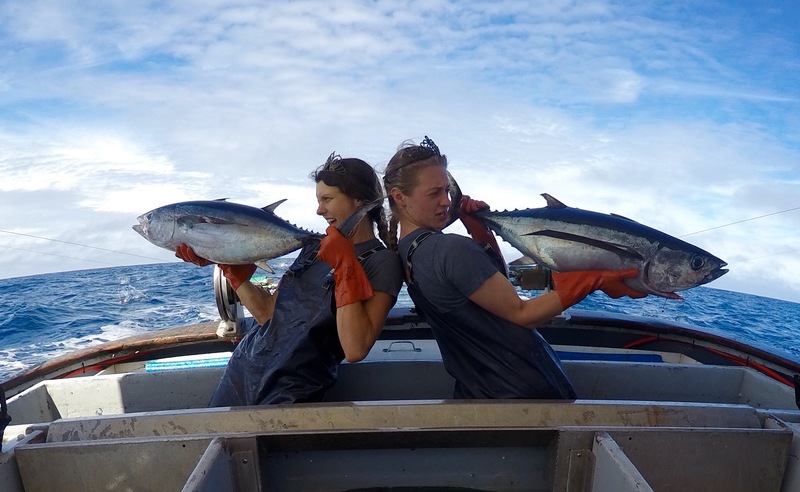 These family-owned boats fish for Wild Pacific Albacore off the U.S. West Coast from June through October, and in the South Pacific from January through April. Artisanal hook and line vessels fished by members of the same families over several generations form the core of the Western Fishboat Owners’ Association. Locally available West Coast albacore is a fish repeatedly recognized by the FDA as nutritionally beneficial. WFOA shares with American Albacore Fishing Association (AAFA) certification by the Marine Stewardship Council (MSC) for troll and pole caught albacore in the North and South Pacific. We are also on the Monterey Bay Aquarium’s “Green List” of sustainabiltiy and good fishing practices. The recognized sustainability of Pacific Albacore fisheries is important for our member-operators, who annually harvest only a small fraction — 15 to 20 percent — of the entire North Pacific catch. The American consumer will find Wild Pacific Albacore one of the best sustainable products on the market — particularly the custom-packed and locally produced products from our members in communities along the West Coast. These family-owned boats fish for Wild Pacific Albacore from June through October, and in the South Pacific from January through April. Details on the nutrition and health benefits of Wild Pacific Albacore are online at PacificAlbacore.com, and information on resource sustainability is available on the National Marine Fisheries Service site at nmfs.noaa.gov/fishwatch online. A rating sheet for most consumer fish species, including U.S. troll-caught albacore, is available from the Monterey Bay Aquarium ”Seafood Watch” website. Also online is a NOAA/NMFS Fish Map by Gear Type for consumers. The WFOA $20/ticket raffle which we usually draw prizes at the AGM were drawn at district meetings on April 15, 2018. There will be a similar raffle for 2019 and we can accept payment for tickets at anytime, see below! If you need a ticket/s send request to WFOA by mail and include check payable to “WFOA 2019 Raffle”, we will mail you the stub/s. or; E-mail request to wfoa@charter.net we do take credit cards. Development of Pacific highly migratory species (HMS) management strategies — as required by the 1995 UN Straddling Stocks and HMS Agreement and the U.S. Sustainable Fisheries Act. WFOA representatives serve on the U.S. delegations at Western and Central Pacific Fisheries Commission and the InterAmercian Tropical Tuna Commission, and participate in both U.S. and Canadian efforts to design a reasonable, effective, and practical domestic fishery management system. WFOA representatives attend legislative and regulatory hearings in all states and nations where policy affecting highly migratory species fisheries — including the albacore fishery — are formulated. We also work in cooperation with other fishery associations on mutual legislative and regulatory issues. We are included as advisors to the U.S. State Department fisheries negotiating team, and have participated in conferences with Mexico, Canada, and the Pacific Islands. WFOA is the managing agency for the American Fishermen’s Research Foundation (AFRF), the only organization of its kind that is funded by fishing and processing community contributions alone. AFRF was founded for the purpose of furthering research into the albacore fishery. AFRF programs — carried out in cooperation from the National Marine Fisheries Service — include compiling data though voluntary logbooks, tagging studies to determine migration and to assess stocks, fish biology, and product quality and waste avoidance. For more detailed information on the Western Fishboat Owners’ Association, email executive director Wayne Heikkila or phone (530)229-1097. To promote, foster, and encourage the intelligent and orderly marketing of fish and fishery products produced by its members through cooperation and other means, and to improve and stabilize the marketing of such fish and fishery products. To engage in all activities authorized by the California Fish Marketing Act and to exercise all the powers conferred upon associations organized under the terms of said Act. From the WFOA By-Laws: SECTION 1.01: PURPOSES. The purpose of the organization is to promote the interests of the hook and line albacore fishery and other small boat pelagic fisheries.